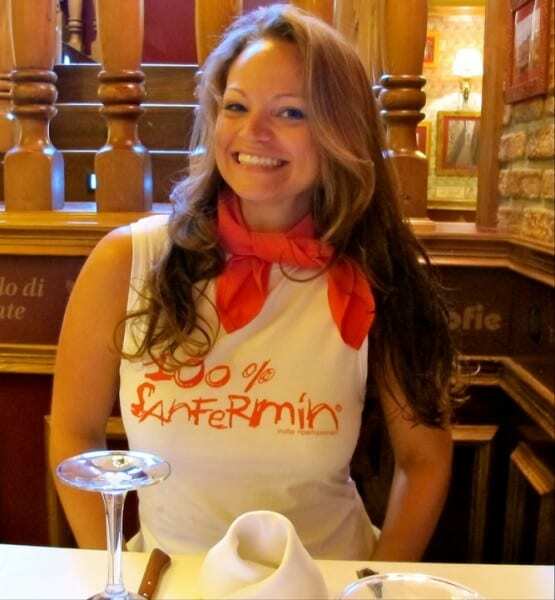 The Running of the Bulls in Pamplona was one of the first items on my travel bucket list, thanks in part to Hemingway’s The Sun Also Rises. The event has everything – a historic Spanish town, a cultural festival, a wee bit of danger and really cute outfits. You would’ve thought that once I finally made it to Spain to experience the fun, I would have the perfect visit all mapped out. Well, I didn’t. I only decided to attend about 10 days beforehand, so all the good hotels & best-view balconies were booked up. Though I felt like a fish out of water when I arrived in jeans (and not red & white! ), I’m still happy I went. Here are some the tips I wish I had before I booked. Hopefully they’ll help you on your adventure! 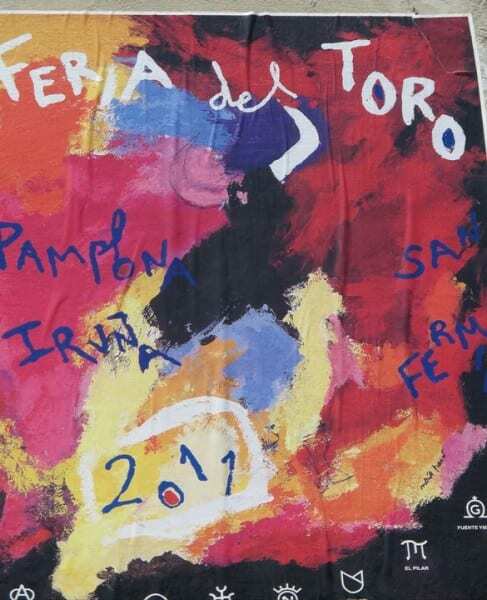 Since 1581, the Festival of San Fermin, or the Running of the Bulls, has put Pamplona on the map. 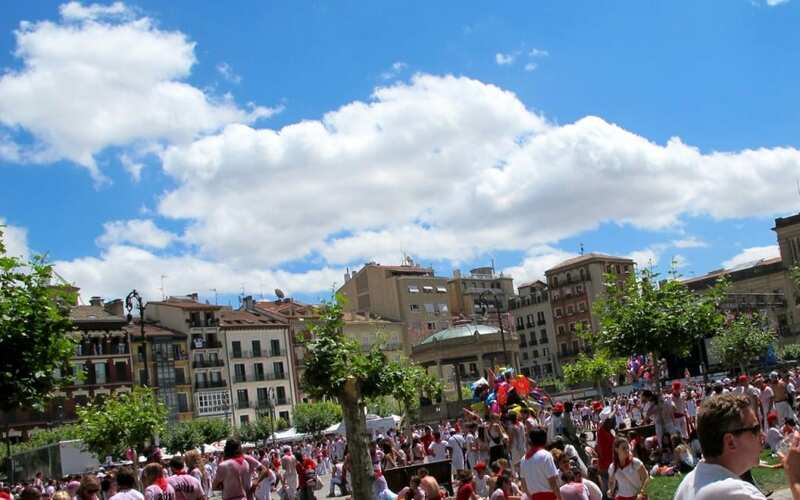 Beginning at 8 a.m. each day from July 7-14, the run is a brief but thrilling 3-minute experience where hundreds of red-and-white-clad runners tear through the narrow streets of Pamplona while angry bulls race after them. 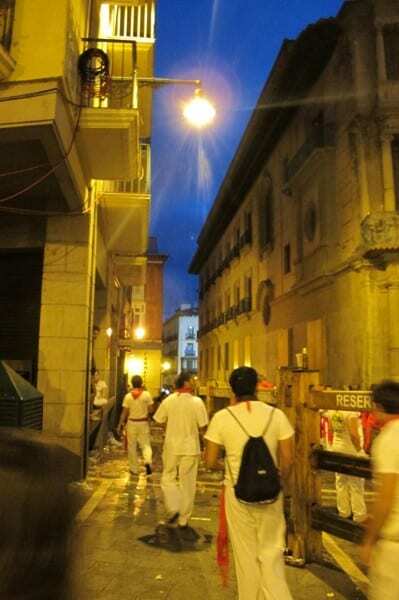 The all-too-fast run is followed by bull fights in the stadium and carousing in the street all day and night. I won’t attempt to share tips for running here because A. I didn’t run and B. you can find more complete tips elsewhere. I do feel a particular duty to inform you that if you’re planning to be a corredor in the encierro, do keep in mind many of the other runners are off-their-faces-drunk and lacking sleep, so their poor decisions could affect your… um, life… along the way. In-town accommodations book up months in advance, so if you’re planning to go this year, you should book right about now. If you’re winging it last minute like I did, don’t expect to stay too close to the action. I stayed in nearby Salinas, a tiny village about 15 minutes by taxi from Pamplona. The fare was around 20 Euros, and getting a cab wasn’t always easy, so booking earlier & closer to town would’ve saved a lot of ground transportation headaches. The hotel rate wasn’t bad ($150/night) though considering I found the room on Priceline just two days before arrival. If it’s too late to book a decent hotel or hostel in Pamplona proper, or if you want to save cash, you have a few alternatives. You can camp in one of the parks in town with the rest of the Gamberos. This is a great option for the young, wild and free, and perhaps those without a bag full of expensive electronics. I couldn’t imagine leaving all my stuff in an unguarded tent surrounded by sangria-drenched crazies all day, so this was never going to be an option for me. 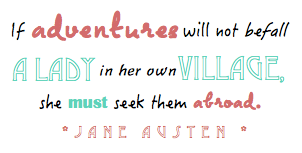 But many do it and live to tell the tale. Many revelers don’t book a hotel or hostel at all, choosing instead to catch their 40 winks wherever they pass out… in doorways or on the floor of the bus station. I am far too cautious for such shenanigans, but it’s there if you have no other option. Remember you’ll likely be covered in wine from various festivities so booking a room, while expensive, may be crucial for shower facilities alone. There are plenty of group tours that may have last minute availability. Some offer accommodations in town while others transport guests to San Sebastian about an hour away. Group tours are great because all activities, ground transportation and accommodations are sorted out, so you won’t waste time translating bus schedules and train tickets. 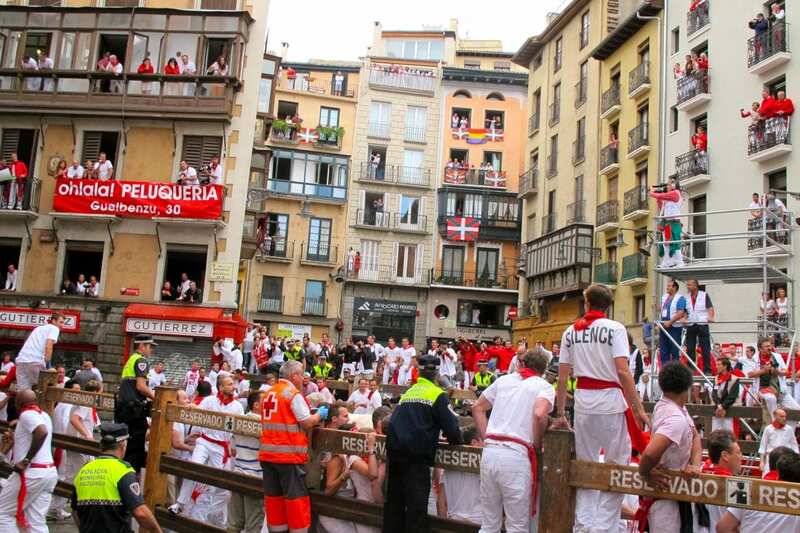 Depending on your schedule and how much revelry you can handle, the tour might be a great, no-fuss option to experience San Fermin. What’s the point of watching the bulls whiz by as you stand behind 3 rows of people?! 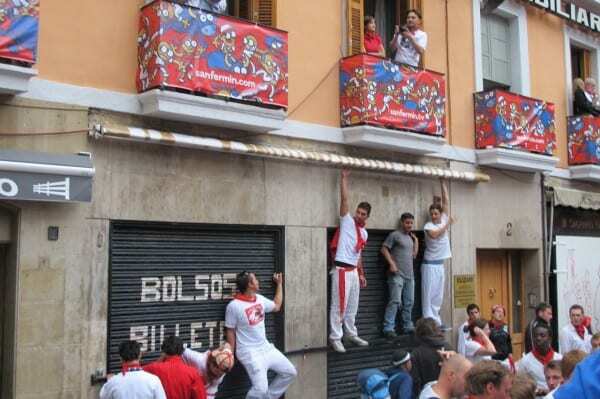 My biggest regret from my visit to Pamplona is that I didn’t fork over that $200 for a birds’ eye balcony view. Balconies usually include a light breakfast and mimosas, you get an unobstructed view of the bulls and the runners. Photos taken from this vantage point turn out exponentially better than the ones I took while perched precariously atop a fence. Say you splurged on a hotel instead of a balcony. It’s ok! You can still enjoy the spectacle. Just get there early – before the sun comes up, stake out a spot and prepare to wait. The Encierro was thrilling even without a perfect view, so don’t be discouraged if you can’t afford to go all out. Don’t be a nerd and show up to Pamplona in jeans and a purple tank top. If you do, you’ll need to slink off the bus and into the first shop that sells red and white clothing. That’s what I did! 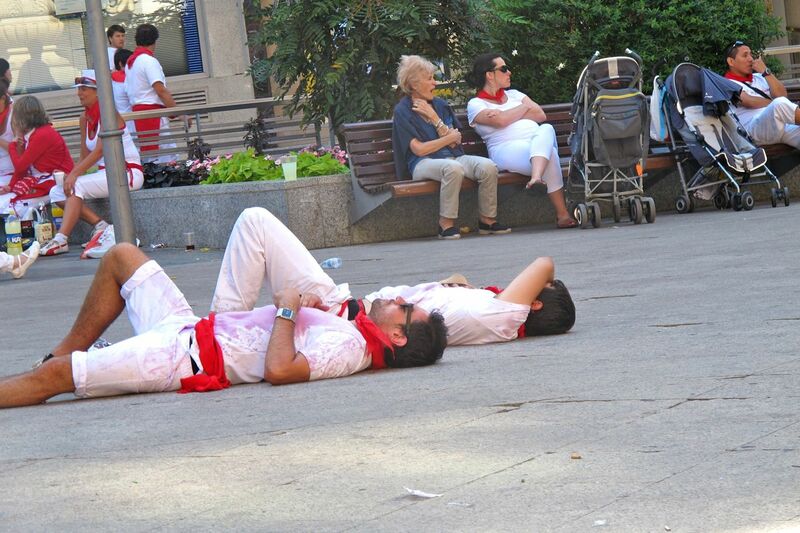 Have you been to Running of the Bulls in Pamplona? Please share your tips for first-timers in the comments! I’ve always wanted to do go for this festival. 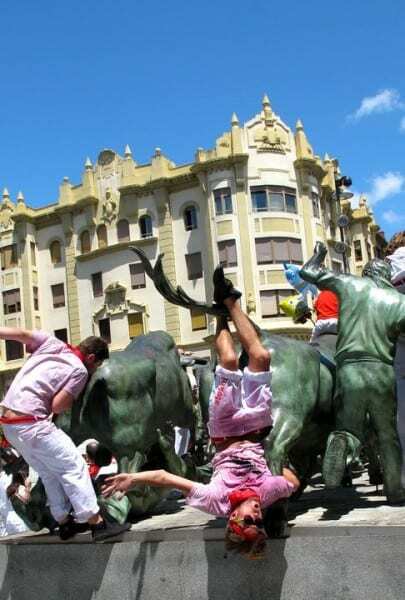 I had some couchsurfers from pamplona saying with me in the states and they said they’ve never ran with the bulls- that’s it’s crazy and dangerous! This looks terrifying. I don’t think I could ever run with the bulls. Great post! We were in Pamplona years ago and did not run either. We too went pretty last minute so had to stay in San Sebastian, took the bus in the evening to Pamplona and stayed up all night waiting for the run to start and then took bus back after. Would like to go back sometime and stay in room with a balcony! I ran with the bulls last year. It was one of the best things I have ever done. Something I will do again for sure! I was so curious why so many people join this tradition because it’s so dangerous and many been injured and few have been killed, but I was curious enough to see the event and it was so crazy! It was like watching a thriller and the participants were chased by huge and long-horned Freddys and Jasons! It’s still on my list…..must get there!